GUESS WATCHES SPRING 2013 EVENT - Join me for tomorrow Guess Watches event at Senayan City for The Spring Collection Product Preview. There will be a Fashion Workshop, Trunk Show and also Mix & Match Styling games for you... If all the things goes on plan, I will be a blogger speaker for fashion workshop :). Sooooo guys, girls, ladies and gentlemen see you tomorrow at Guess Watches Spring Collection Product Preview event only at Guess Accessories, Senayan City. I am too late to attend the event. Guess watches are the part of my favourite accessories but feeling bad that I can't attend this event. Please update me for the next event. i love so much for guess watches. 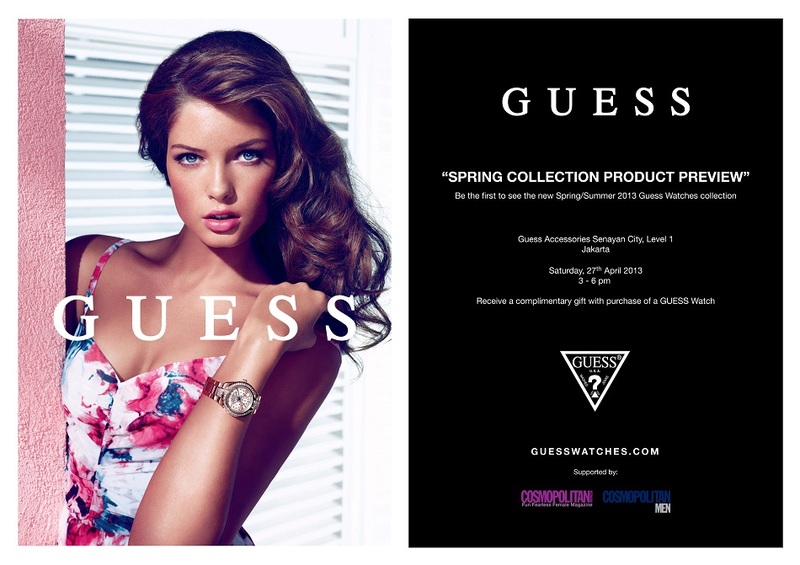 Pleased to know about this guess watches spring event. Being an accessories freak, I arranged men’s accessories event by booking one of the elegant NYC venues. Got excellent response from the public and it was a successful event. Had good time there.